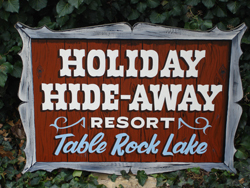 Holiday Hideaway Resort is a 15 cabin lakefront resort located in the Aunts Creek area of the James River Arm of Table Rock Lake. By land we are off of Highway 00 between Branson West and Kimberling City. By lake we are near Point 10. We offer fully equipped kitchenette cabin accommodations for the family and the fishermen. Check out our website and facebook page for full information. *Fire pit, horseshoes, volleyball, shuffleboard, ping pong.